“A region which – until just a few short years ago – had the goal of universal education well within reach, today faces a disastrous situation,” says the report, Education Under Fire, which focuses on the impact of violence on schoolchildren and education systems in nine countries that have been directly or indirectly impacted by violence. The UNICEF report says attacks on schools and education infrastructure – sometimes deliberate – are one key reason why many children do not attend classes. “In Syria, Iraq, Yemen and Libya alone, nearly 9,000 schools are out of use because they have been damaged, destroyed, are being used to shelter displaced civilians or have been taken over by parties to the conflict,” it says. Other factors, according to the agency, include the fear that drives thousands of teachers to abandon their posts, or keeps parents from sending their children to school because of what might happen to them along the way – or at school itself. The report calls on the international community, host governments, policy makers, the private sector and other partners to: reduce the number of children out of school through the expansion of informal education services especially for vulnerable children; provide more support to national education systems in conflict-hit countries and host communities to expand learning spaces, recruit and train teachers and provide learning materials; and in countries affected by the Syria crisis, advocate for the recognition and certification of non-formal Education services. 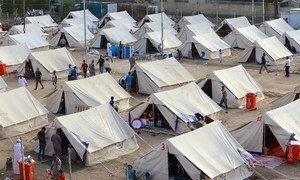 The United Nations Children’s Fund (UNICEF) today said that over the past year in Iraq, it has seen a 75 per cent increase in grave violations against children that include killing and maiming, abduction, recruitment as soldiers, sexual violence, attacks against schools and denial of humanitarian access.